Genomics has changed the face of the livestock industry. Culling decisions can now be made on a computer without even seeing the animal. Genomics has also created opportunity decisions. 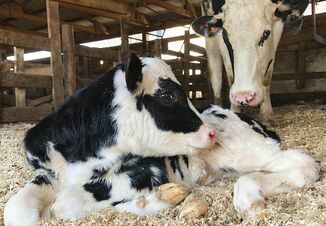 The biggest by-product of the dairy industry is the Holstein bull calf. Raising Holstein steers can be a profitable venture when beef prices are favorable, but just like any commodity, volatility is a challenge to manage. Both dairy and beef producers have seen, and seized an opportunity to create a value-added calf by using genomics. UW-Extension agents serving on the 2017 Farm Technology Days education committee had a unique opportunity to learn more about how dairy-beef cattle perform on farm and in the cooler. Ebert Enterprises, host of the 2017 Kewaunee County Farm Technology Days show maintains current milking herd size at approximately 3,500 cows. In order to maintain herd size, a beef crossbreeding program using a Sim-Angus sire is implemented on the bottom one-third of the herd. Cows are bred to beef each service until she is culled from the herd. All dairy-beef heifer and bull calves born on the farm are raised out for beef. Newborn calves are treated and processed the same as dairy calves on the farm. Newborns are fed one gallon of high quality colostrum and vaccinated with three-way vaccination. Calves are individually housed in pens for 5-7 days and fed three quarts of pasteurized milk twice daily. Calves are then moved to a mob feeder in groups of 25 and fed approximately three gallons of milk per day. Dairy calves and dairy beef calves are housed separately. Calves are also outfitted with jackets in cold months for approximately 30 days. After weaning at 60 days, calves are fed a grain and forage diet and housed in groups of 10-12. At approximately 5-6 months of age, animals are fed a diet consisting of dairy herd refusals and additional minerals until they are sold at approximately 1,400 pounds. Ration feed cost to gain is valued at $0.48/lb. Yardage cost to gain is $0.84. Other costs per head totaled $161. Breakeven price sold was $106/cwt. 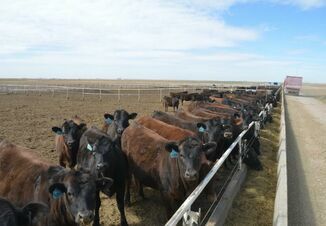 Seventeen head of cattle from Ebert Enterprises were processed at a local slaughter plant. The lot consisted of ten steers and seven heifers. All the beef from the animals was ground and served as burgers at Farm Technology Days. Carcasses were evaluated two days post-slaughter for yield grade and quality grade. Individual live weights of the animals were not available for the lot, so estimated weights were determined based off a 60% dress percentage. For choice or better steers and heifers, value was assigned at $110/hundredweight (cwt), and high yielding choice or better steers and heifers at $121/cwt based on calculated yield grade. Animals with yield grade of 1 or 2 were assigned the high yielding average value ($121/cwt), while animals with yield grade 3 or below were assigned the average yielding value ($110/cwt) based on the assumption buyers were paying more for the higher yielding animals on a live weight basis. Using a beef breeding program in the herd gives dairy farmers an opportunity to add value to an industry by-product. Feedlot owners can also benefit by purchasing a lower priced calf and feeding it out with decent profitability potential. Just like any livestock venture, individual performance and profit is based on management, input costs, and sale price.